Please email the Coordinator at admin@crpalaska.org if you are planning to call-in. 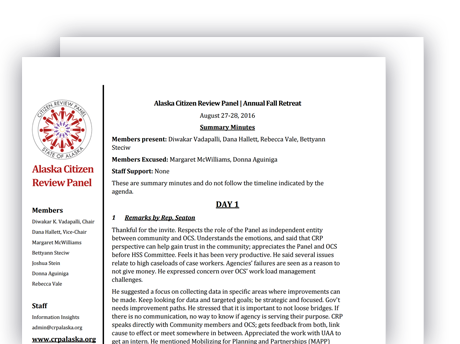 The Alaska Citizen Review Panel is a mechanism for meaningful public participation in child protection policy and practice. The Panel is an opportunity for Alaska’s citizens to engage in an intensive and rewarding public process to assist Alaska’s child protection system in being more responsive to the community’s needs. Learn more about the duties of the Citizen Review Panel. Contact the Citizen Review Panel and learn where to find other resources. Find CRP annual reports, meeting notes, presentations and other documents. In May of 2017, CRP members gathered for a series of talks, presentations, panels, and more. Click here to learn more about the 2017 conference.